The cool square and angled design of the Tees range and chrome plated finish makes a style statement in any bathroom. 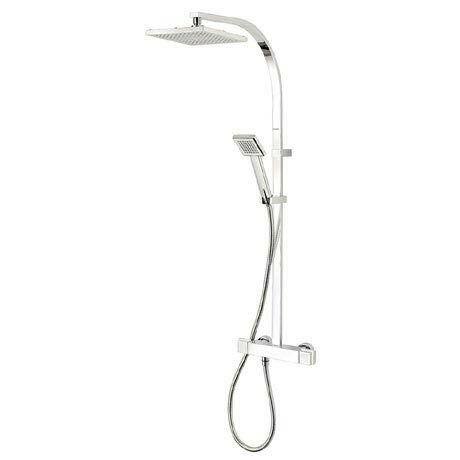 This thermostatic bar shower mixer features individual controls for temperature and flow and combines the luxury of a large 200mm square shaped fixed head and a matching height adjustable handset. Its thermostatic feature gives a constant regulated temperature giving you more precise control and safer showering, whilst the automatic shutdown function is an added safety feature should any of the water supplies fail. Running water pressure: From 0.5 bar min. 5.0 bar max.